The Episode starts with Raavan’s ten heads appearing in his anger. He shouts Surpanakha, go if you want, but never return to Lanka ever. She gets tensed. Raavan’s ten heads disappear. She asks Raavan to kill her and get free from her. Raavan gets sad seeing her tears. She says when I was born, do you remember what dad said, he said no one will marry me, I m Krup Balika, what did you say then, tell me. Raavan says I asked dad to leave it on me. She says and you want to disown me now, fine I won’t go there. He says I m your elder brother, I worry for you, fine, go and rest now. She leaves. 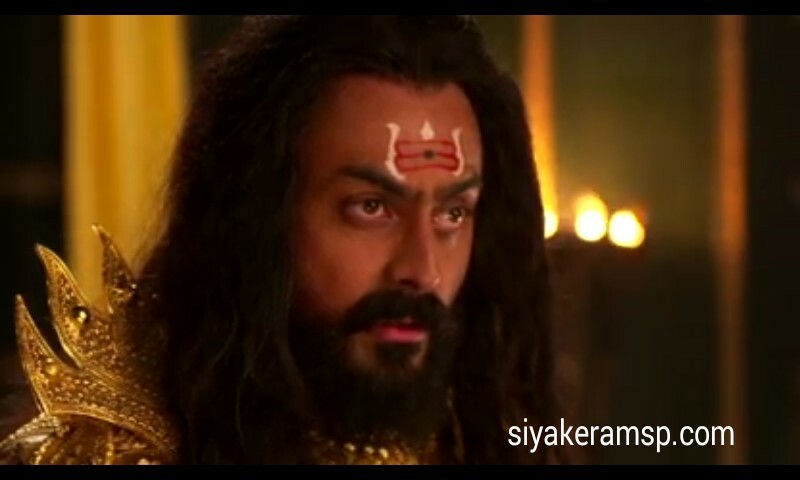 Malyavaan talks to Raavan. Raavan says I m not emotional, she thinks she fooled me, but thinking this is her foolishness, Nana Shri you know difference between dog and cat….. Dog is loyal by nature, he does not need trust, his decision is by his Lord, but cat needs to be assured, that whatever decision is taken is by her wish. Malyavaan asks and Meghnadh? Raavan says there is difference between dog and cat’s thinking. A man asks someone to close the door, sunlight is not allowed to reach him. The other guy says I have a news, I have seen three humans, its possible they have made Rakshaks go, they all look young, they will be good to eat, I will kill them and get you from here. The first man asks them not to break his rules, don’t cheat them, don’t attack women, its possible they know hunting birds. The other guy says maybe possible, but today they will face Chatayu….. he turns into a hawk and flies. Sita hears some sound and gets alert. She looks at the sky and sees birds flying. Laxman is guarding and asks Sita is everything fine. She says all birds are leaving from the nests, its possible when storm is coming or any big harmful bird infront of them. Laxman says there is no cloud, no possibility of storm, don’t worry, go inside. She sees a big hawk coming towards Laxman and shouts Laxman. Laxman turns and jumps down. He shouts to Sita and asks her to just move. Chatayu attacks Laxman. Sita thinks if this bird is brought infront, it will be easy for Laxman to target the bird…. She goes infront. Laxman asks her what is she doing, go inside the hut. She asks Laxman to aim. The hawk flies to pick Sita. Laxman aims and shoots at the hawk. Chatayu gets trapped in the net and turns into human. Sita asks Laxman not to kill him. Laxman says why, he attacked you. Sita says he had chance and did not attack me, its not ordinary bird. Chatayu says I don’t attack women, else you would have…. Its better you kill me, I know you are Rakshaks who are staying in human form. She says no, we are humans. Laxman says I m Laxman, I came here with my elder brother, she is my Bhabhi Sita. She says we will call Dasharath Nandan here first. Chatayu asks do you mean Dasharath’s son, Ayodhya’s king’s son. She says yes. Chatayu says take me there, I know him, I want to meet him. Laxman says how did you think we will trust you. Sita says we have to trust him if we have to give him a chance, where there is no trust, life is not close to humanity. She smiles. Laxman and Sita reach Ram. Ram asks who is this. Laxman says some miraculous bird, he tried to attack on us, I was going to kill him, but Sita stopped me and asked me to bring him here, this hawk wanted to meet you……. Ram holds the net and net disappears. Ram holds Chatayu….. Chatayu says Dasharath Nandan’s Ram…… I heard about your birth, and asks something. Ram asks what do you mean to ask about. Chatayu falls in his arms. Ram says it seems he did not have food since long, Laxman arrange food, go. Laxman says sure, and goes. Sugreev and Roma are getting wedded. According to varmala traditions, Roma’s buddy should be providing her the varmala. Roma problems. Roma’s mum says I will do traditions. Hanuman comes and delivers Roma’s mother and father there. He says does wedding occur without parents’ delights. Gandharao Raj gives varmala to Roma. Sugreev and Roma return the garlands. Gandharao Raj blesses Sugreev and says I m grateful Hanuman confident me to come, else I would have not seen my daughter’s pleasure, I deliberation over Hanuman’s terms, if I give my abilities and data to Sugreev, I can create him best in fight abilities, after getting this soldier information and fight abilities, if Sugreev becomes the go of his military, he will be best and can don’t succeed any Asur military. Hanuman excellent remarks Sugreev. Gandharao Raj says this information will certainly help Sugreev in any fight. Devi Parvati informs Mahadev that Hanuman has satisfied a big responsibility nowadays. Mahadev says he will have more big responsibilities, this wedding will become a observe in satisfying Ram’s big purpose. Ram creates Chatayu sit…. Sita flows h2o on his side. Laxman gets fruits and veggies for Chatayu. Sita says he is Maasahari fowl, he needs meat/flesh in meals, that’s why he is not consuming the fruits and veggies, I know what to do, I will just come. Chatayu requests Ram about his buddy. Ram requests who. Chatayu says Dasharath. Ram and Laxman get shocked…. Chatayu says we were near friends..
Raavan looks at the dandak van map and programs with Malyavaan to fight Ram and Sita. Raavan says they are relaxed now, as they are not eliminating any Rakshaks, but got active in improving protection.